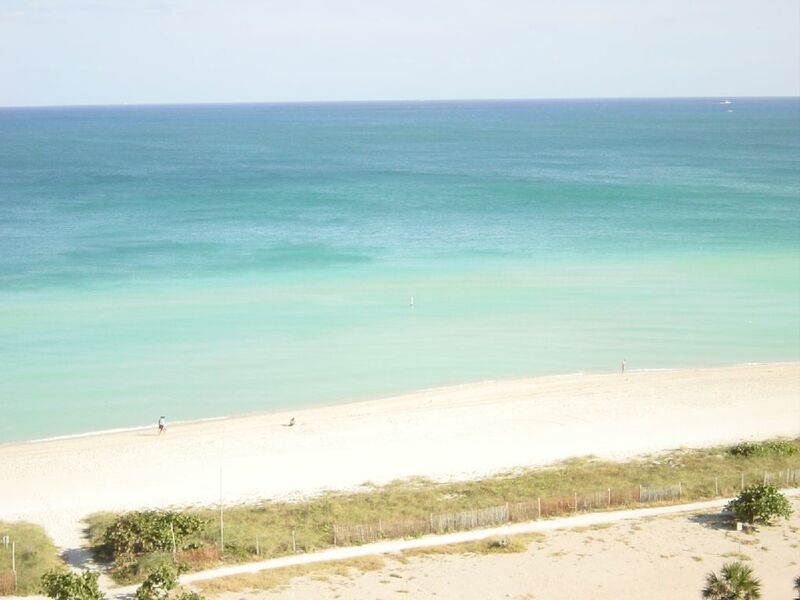 Gorgeous apartment located on one of the best beaches Surfside (Miami Beach). Great apartment and location 10 minutes north of South Beach and walking distance to Bal Harbor. The Town of Surfside is a quiet residential community with great restaurants and shops. The apartment is fully furnished with high end details including marble floors, granite counter tops in kitchen and marble baths. Furnished in a contemporary style. The apartment truly has everything you would need for a short or long stay. Details include all linens, fully equipped kitchen, dish washer, washer/dryer, local and national long distance, cable, wifi Internet, stereo, CD/DVD, selection of movies and music. In addition to all your beach needs, chairs, floats, umbrella, cooler, etc. The best of all is the view from the balcony. Sit back and relax as you look at the Ocean to the East, City and Bay to the West. The building has a pool and jacuzzi and steps to the beautiful beach. Paradise just sitting on the balcony! What a beautiful place and location. We enjoyed our meals on the balcony just watching the ocean and gorgeous views of the city too. The owner has everything for the beach chairs, cooler, umbrella and a cart to bring it all down too. I will definitely come back again . We just loved it! My family of 4 stayed here for 7 nights and had a great time. The pictures are a true representation of the apartment. The beach is steps away from the room and the views of the beach and of the city are amazing. There were numerous items that the owner let us use including beach chairs, toys, beach towels, floats and it came fully equipment with anything you would need in the kitchen. I loved how secure it was and that you had your own personal parking spot. I traveled with two children one being a toddler and it was a perfect place for a family. It is close to Miami but far enough away so you don't have to deal with the busyness of the city. There were very few people on the beach which made it even better for us. Thanks to the owner of the property for such a pleasant stay and for such great communication. A special thanks to Robert who met us there and gave us a warm welcome and a warm departure. He made sure we were taken care of and even contacted me throughout the week to make sure we were having a good time and told us to make sure to let him know if we needed anything. If we decide to travel to Surfside again, this will be my apartment choice. French family of 4, we stayed 12 nights in August 2013. .
All the pictures are truthfull. the beach is literally 10 steps out of the lobby lifts and owner let us use many necessary items (Beach chairs/embrellas/floats etc..).Flat is just north of Miami Beach town and away from the noise and masses; we never had more than a few people on the beach. Very close to Publix, convenience stores and a few restaurants. Special Thanks to Robert for his warm welcome and taestefull decorative arrangements. On a side note, owner should really install a couple of flat screens, the present one cheapens the place undeservedly..
Lots of activities in the area. Close to all the South Beach night life, theater, movies, concerts, performing arts and more. Also a great deal of outdoor fun on the beach and jet ski rentals a block over, kite surfing instructors on the beach, not far from Haulover Marina where you can charter a boat, fish, or South Florida's only clothing optional beach at Haulover. This area has something for everyone. If you have any questions don't be shy. If interested in seeing Miami from the Water side a private boat tour can be arranged. Contact me for rates minimum 3 hours 27 Foot Bow Rider. Please request quotes for holidays and special events as rate are higher. 5 night minimum during winter months. Cleaning fee is $125 additional plus $500 refundable security/damage deposit.